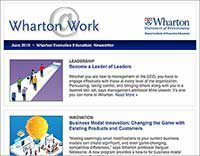 Whether you need to refresh some existing business skills or quickly develop new ones, Wharton has the right program for your specific need. 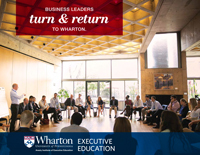 Our Business Acumen programs, in areas such as Finance, Marketing, and Strategy, are rigorous, practical, and designed for a high level of engagement with our world-class faculty. And, they have one focus — on educating you. Gain an in-depth understanding of new forms of customer data, enhance your ability to forecast customer behavior, and acquire the skills to develop and execute effective monetization strategies. Understand and evaluate key aspects of digital marketing, including digital strategy and social media, to enable successful development and implementation of relevant and powerful digital marketing efforts. Build mastery in formulating, negotiating, managing, and evaluating alliances. Adopt practical tools for establishing a global strategic position, even with limited time and resources, and for overcoming many of the obstacles inherent in new market expansion and new product development. Explore the most important factors involved in implementation, including leadership, talent management, and organizational design. Learn a logical approach to execution that will help you overcome even the most challenging obstacles. Create new business models, launch new products, improve customer experience, and open new markets. With an "Innovation Toolkit," you can design a flexible innovation process that lets your company quickly adapt to, and profit from, changes in customers, competitors, or markets. Learn to accurately assess the competition, design a compelling strategy, leverage your firm's capabilities to full advantage, and obtain necessary resources through alliances, acquisitions, and internal corporate ventures.